A challenging trekking holiday around Manaslu in the Nepal Himalaya. Manaslu at 8163 metres (26783 feet) is the eighth tallest mountain in the World. 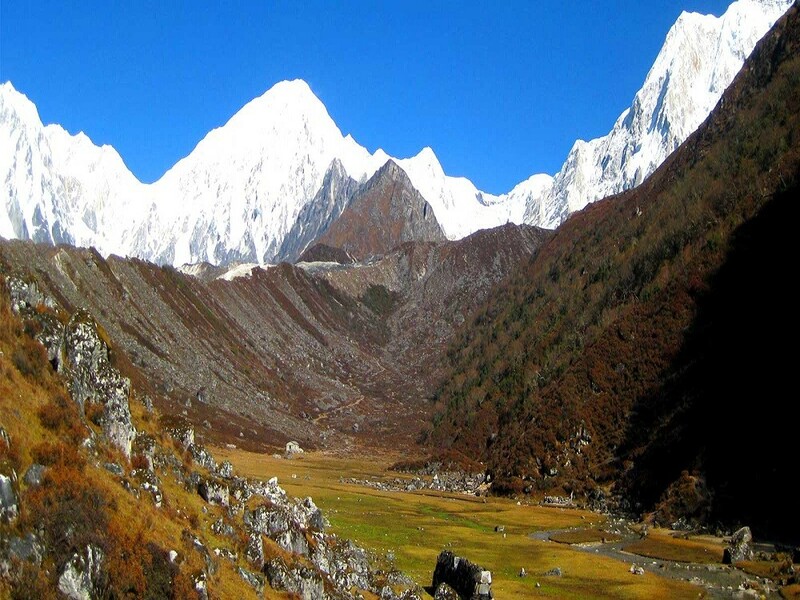 Situated close to the border with Tibet, some 100 km (62 miles) northwest of Kathmandu, the valleys to the north and east of Manaslu were a restricted area until the early nineties when KE Adventure Travel were one of the first companies granted permission to take groups trekking into the region. For the past few years the political unrest throughout Nepal has prevented groups from trekking into the Buri Gandakhi, but with the ending of the insurgency this classic circuit trek is once again possible. This area has always seen relatively few trekkers when compared to the more popular regions of the Annapurna and the Khumbu, partly because of the greater logistics required. The quiet trails and simple villages, together with the stunning scenery around Manaslu make this one of the classic yet unspoilt trekking advenutres in the Himalaya. Travelling via Gorkha on the south of Manaslu, we start from the town of Arughat and ascend the impressive gorge of the Burhi Gandaki for seven days, passing through tiny villages perched on the steep valley sides, to reach the Tibetan world beyond the village of Ghap. Here, the valley starts to open out, and there are remarkable panoramas of the peaks on the Nepal-Tibet border, as well as those of the Manaslu group. Few travellers penetrate this high and mysterious valley, which once had much more important trading links with Tibet than it does today, and we have the feeling of entering a secret Buddhist world of monasteries, mani walls and prayer flags. The scenery becomes even more impressive as we climb up into the alpine environment on the approach to the Larkya La (5135m), with big peaks on all sides. The principal peaks that we will see on this first part of our trek are Himal Chuli, Manaslu, Cheo Himal and Himlung Himal. Beyond the Larkya La, we drop down into the heavily forested valley of the Marsyangdi River, where we are now trekking beneath the giants of the Annapurna range, following the river down to a meeting with the roadhead. This is classic Nepal trekking as it used to be! You are welcomed by hospitable meeting and then you will be transferred to hotel. Our airport representative will explain briefly the program upon arrival. Overnight at Hotel. B.B. Sightseeing of world heritage sites in Kathmandu valley including, Kathmandu Darbar square, Swayambhunath Temple, Boudhanath Stupa & Pashupatinath Temple. Overnight at Hotel. B.B. Day 03: Drive Kathmandu to Arughat (640meters) 8 hours. Your Trekking staff will come to your Hotel early in the morning at 7.00 am to pick you up; from there we have an 8-hour driving journey to Arughat. From Kathmandu to Dhading Bensi (The district headquarter of Dhading1050m) for 4 hours is a comfortable drive but from there to Arugat for another 4 hours, we will be driving on rough road. Overnight at Tented Camp. B.L.D. Day 04: Arughat to Soti Khola (775meters) 6 hours. Along the Budhi Gandaki River toward its point of origin. We pass the village of Morder and Simre to reach Arkhat River. After Arkham, we ascend slowly toward Kyoropani. Camp today nears the confluence of Seti River - an ideal place to take a fresh water bath. Overnight at Tented Camp. B.L.D. Day 05: Soti to Machha Khola (900meters) 5.30 hours. Trail descends slowly until you climb again to mountain ridge to Almara. Pass the forest trail to arrive at Riden Gaon. The valley here cuts into another side of the river to enter Budhi Gandaki. At Lambesi, the trail follows down to the sandy river bed of Budhi Gandaki. Overnight at Tented Camp. B.L.D. Day 06: Machha Khola to Jagat (1340meters) 6 hours. After crossing Machha River and Khrola besi, there is a hot spring called "Tatopani". The trail follows forested area after this toward Dovan. Below Dovan, there is a huge rapid at Budhi Gandaki. As the elevation increases, the rapids and the scenery undergoes a complete transformation. Overnight at Tented Camp. B.L.D. Day 07: Jagat to Ngyak (2310meters) 6 hours. After ascending to a terraced hill of Saguleri and view of Sringi Himal (7177 meters) we continue toward Sirish Gaon, Gandaki valley narrows from herewith soaring precipitous walls. Overnight at Tented Camp. B.L.D. Day 08 : Ngyak to Ghap (2100meters) 6 hours. Follow the trail upstream of Deng River - a tiny village of 4 houses. We walk through a newly built rock tunnel from here, thus avoiding the traditional steep climb. At Ghap, the Tibetan culture begins with Mani stones and chortens all around. Overnight at Tented Camp. B.L.D. Day 09: Ghap to Lho (3200meters) 6 hours. After crossing the wooden bridge over Budhi Gandaki we follow the path lined with houses that are interspersed with cultivated fields. At Namru, there is a police check post again. After Namru, across the Hinan river originating from Linda Glacier and continue on to Sho. Naike peak, Manaslu north (7774 meters) and Manaslu (8150 meters) are visible from here. Tonight we camp near a spring at Lho gaon - a small village. Overnight at Tented Camp. B.L.D. Day 10: Lho to Samagompa (3500meters) 6 hours. You will pass the stone gate and long Mani stone wall of the village after Lho with full view of Peak 29 ahead. 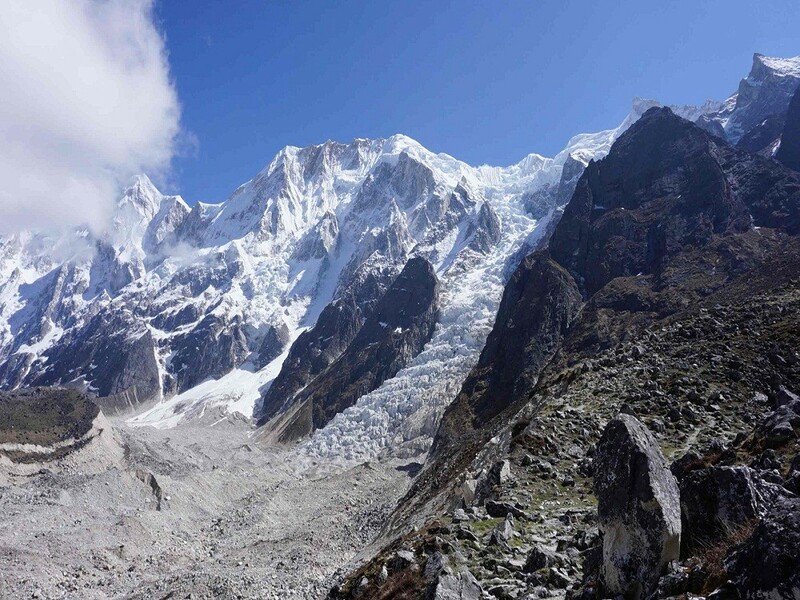 You can make a side excursion to Pungen Glacier from here to get a very close up view of Manaslu. Follow the lateral moraine of Pungen Glacier toward Sama. From the village of Sama, it takes another 20 minutes to reach Sama Gompa for night halt. O/N at Camp. B.L.D. Day 11: Samagompa to Stone Hut (4500meters) 5 hours. Today we climb a terraced hill on the opposite bank of Budhi Gandaki River from here toward a most remote permanent settlement - Samdo. Here amid the most sever conditions of nature live some 200 villagers in forty houses check-by-jowl. Camp at Stone Hut. O/N Camp. B.L.D. We will spend a day here in order to acclimatize and adjust to the reduction of the air and also for the local excursion. Overnight at Tented Camp. B.L.D. Day 13: Stone Hut-Cross Larkya La (5215m) and trek Bhimphedi (3590m) 8 hours. We first climb towards Cho Chanda and then slowly head steeply uphill towards the snowed-up pass. From the top the panorama is magnificent: Himlung Himal (7126meter), Cheo Himal (6820meters), Gyagi Kung, Kang Kuru (6981meters) and the Annapurna II (7937meters). The descent is steep, through moraines, towards Bhimphedi. Overnight at Tented Camp. B.L.D. Day 14: Bhimphedi to Tilje (3900meters) 5 hours. We start with a gentle climb through paddy fields towards the small Karcha La pass and descend through fig tree and rhododendron forests to Tilje. Overnight at Tented Camp. B.L.D. Day 15: Tilje to Tal (1725meters) 5 hours. Follow the trail downstream of Marshyangdi River, passing through the scattered villages to reach Tal village for overnight stay. Overnight at Tented Camp. B.L.D. Day 16: Tal to Jagat (1300meters) 5 hours. Today the trail runs gently downstream of the river passing the village of Chamje and Himal pani We will have overnight stay at Jagat. Overnight at Tented Camp. B.L.D. Day 17: Jagat to Besisahar (720m) 6 hours. Descending gently for 30 minutes and the trail runs gently down to Syange village, and then catch the jeep to Besisahar, Overnight at Tented Camp. B.L.D. Day 18: Drive back to Kathmandu by bus 7 hours. Overnight at the hotel. B&B. Day 19: Transfer to the International Airport for your home departure. Above metion rates per person, if candidates are less then 4 persons price can little increase, at least one month before physically fitness you can do yoga, walking and other normal excercise.